Chickpea/garbanzo beans, spinach is a delicious, nutritious, protein rich soup made for a nice addition to our weekly dinner menu. 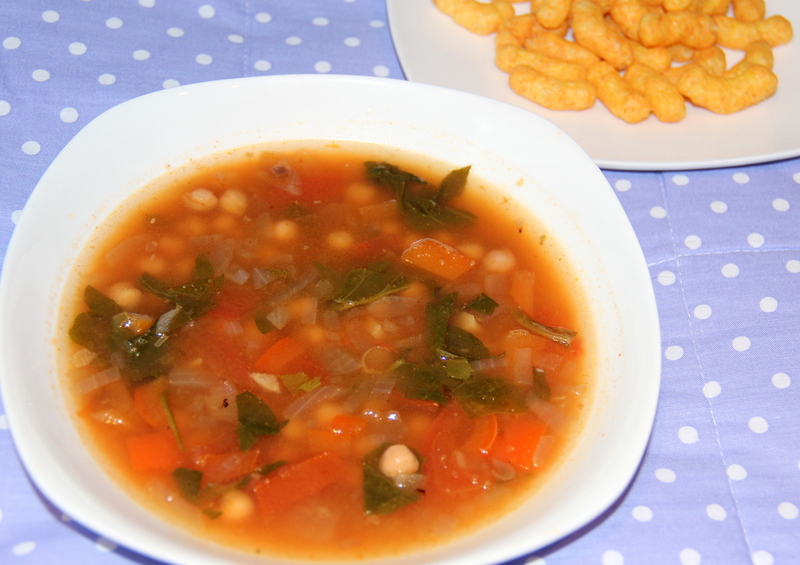 Here chickpeas, spinach are cooked in tomatoes, with a ting of apple sauce flavoured by garlic and spiced by paparika. Spinach and bean soup can be low in calories and fat content. Soup made with water or vegetable-based broth will contain the fewest calories. Soup made with low-fat or non-fat milk will supply more calories, but still fewer than cream-based soups. Heat oil in a large pot over medium heat, add onion and saute for 3-4minutes/until soft and slightly golden. Add garlic, bell peppers/capsicum and saute for 2-3minutes more or until garlic is lightly browned. Add paprika, salt, tomato puree, apple puree, and saute for 2-3minutes on medium flame. Then add spinach, chickpeas and simmer for 8-10minutes. Season with ground pepper and serve hot. Cooking chickpeas-rinse and soak chickpeas for 6-7hours, then drain and cook in a pressure cooker for 4-5whistles. Or if using canned drain and rinse thoroughly. Chilli powder can be used alternatively to paprika. Posted on August 31, 2014, in International, Soups, Salad and Wraps and tagged Chitras healthy kitchen, drchdietfood, Healthy soup recipes, Soup recipes. Bookmark the permalink. 14 Comments. wow, applesauce in soup… that is new! It would add a nice tangy taste too, I’m sure. One of my favorite kinds of soup! Hello, thank your for your helathy recipes. Il always prefer home-made meals, and from time to time, un nice pastry and hot chocolate at a terrace ! Congrulatations. Pleasure is mine….I am very happy you liked the recipes…. Dear it’s just apple puree from apple and I used with peel, you can either retain or discard as per your taste….